KFC or Kentucky Fried Chicken? I received a rather disturbing email from a friend yesterday on everybody’s favorite ayam goreng KFC. Yes, I’m a yoga fan but I DO indulge in “good” food sometimes. Read the below article and decide for yourself OK? Kentucky Fried Chicken has become KFC. Does anybody know why? We thought the real reason was because of the “FRIED” food issue. The reason why they call it KFC is because they can not use the word chicken anymore. Why? KFC does not use real chickens. They actually use genetically manipulated organ isms. These so called “chickens” are kept alive by tubes inserted into their bodies to pump blood and nutrients throughout their structure. They have no beaks, no feathers, and no feet. Their bone structure is dramatically shrunk to get more meat out of them. This is great for KFC. They do not have to pay so much for their production costs. There is no more plucking of the feathers or the removal of the beaks and feet. The government has tol d them to change all of their menus so they do not say chicken anywhere. If you look closely you will notice this. Listen to their commercials, I guarantee you will not see or hear the word chicken. I find this matter to be very disturbing. Putting aside the photograph of the naked chickens which has nothing to do with KFC at all. The real reason was in fact the ‘fried’ issue. Because of the sudden shift of a healthier lifestyle, Kentucky Fried Chicken has undergoed a branding effort to be known just as KFC. Also, the poultry used by KFC varies country by country. I’m in Australia so they use local poultry here. For Malaysia, I’m certain it’s from Ayamas. I would say the email is misleading by all means. It’s like that myth about someone finding a fried rat while eating at KFC! Besides, even if it were using the chickens pictured here, they’re still chickens. 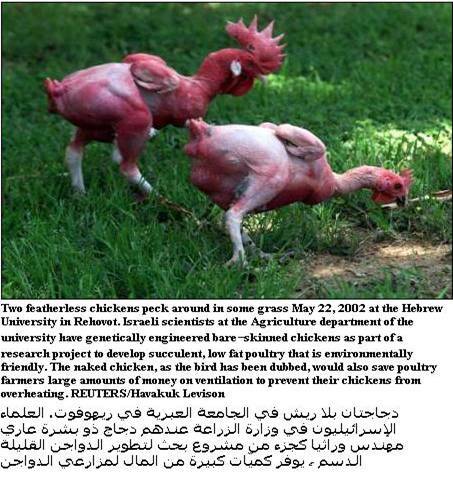 They’re just featherless chickens. Thanks for pointing things out all, but my weekly quota for KFC is still not more than once a week. But then again now they are serving breakfast, maybe it’s time to review the quota. 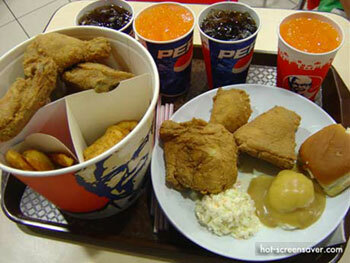 i love KFC. but i really eat it only once in a blue moon. like really really seldom. the spicy fried chickens make me drool! why don’t you reference the so-called university of new hampshire study? I have received this kind of mail even few years back about KFC. I actually only believe in 50%. Now a day, there are just too many mails around sharing some knowledge of certain things, but all these are not certified by nay authority. i dont think the chickens in the picture do not have beaks n feet lol!! they r just featherless which i think is quite possible due to some malnutrition or they r genetically modified (featherless) for studies about poultry. What about the fact KFC fries everything with PALM OIL ! Another big greedy corporation insisting on useing PALM OIL without the care of the fact that the Palm Oil Plantations throughout Indonesia and Borneo (100% funded by china) are created by clearing the natural rainforest, home of thousands of felllow earth creatures including one of mans closest relatives the peaceful and defenceless ORANGUTANS. Our unwilling support and purchases of products created with or containing PALM OIL is the sole reason the earths amazing ORANGUTANS have been pushed to the brink of extinction! ENJOYING THE DECEPTION? ENJOYING WHAT YOU ARE RESPONSIBLE FOR? Bueno, cadbury, kitkat, OREO, Pringles, MARS, Hersheys, FERRERO ROCHER, TimTams, Milo bar, you know or discover any others please let me know, Ide appreciate it. Check your next chocolate bar before you purchase and support the death and destruction. Check your next biscuits & cookies before you purchase and support the death and destruction. Check your next potatoe chips & crisps before you purchase and support the death and destruction. Check your next skin care product before you purchase and support the death and destruction. If the ingredients include ‘vegetable oil’ and the nutrition includes ‘saturated fat’- you can be sure your buying and supporting palm oil. Palm Oil & Coconut oil are the oils which are ‘saturated fat’. (by the way, that makes it so bad for your health as well. But these big greedy companies dont dseem to care about that. They dont care about YOU or the earths environment and its creatures. Dont you think it’s time to ”evolve’!…..
some people are just stupid. People tell them that is poison, they still say no, no no, it’s not. its not true. no care about it. just eat as they tasted nice. no wonder so many deformed baby nowadays. eat more please. see whether your baby will become like that or not next time. live with tubes and pipes in the body. My GOD!!! Shocky ofcourse coz I did consumed almost lots of it being not informed. Thanks for the add. This is the stupidest thing urban legend ive ever heard! PERIOD. I raise chickens for KFC in malaysia and i can assure u, our chickens hav feathers and beaks. come to kedah and see for ur self. u r right mr bond… some people ARE plain stupid. If this was the case it would be a lot less cruel than with ‘real’ chickens.